Festivals, markets and movie screenings – 14 handpicked events of the month proving that December is not just all about New Year's. When: every weekend starting December 1, 1 p.m. – 9 p.m. So much loved by locals Pesochnica is opening for the winter season: great market with handmade souvenirs and gifts and entertainment that suits any taste: grill area, photo zone, ice figures, prize drawing and giveaway, snow tubing rides, Dj’s music, snowboard show, etc. When: December 1, 5.20 and 9 p.m.; December 12, 8 p.m.
You can watch the restored version of the famous John Lennon and Yoko Ono film “Imagine”. The new version contains exclusive bonus material that will be a real gift for all The Beatles fans and connoisseurs of classic rock. “John Lennon and Yoko Ono: Imagine” is an exciting film collage of color, sound, dream and reality. 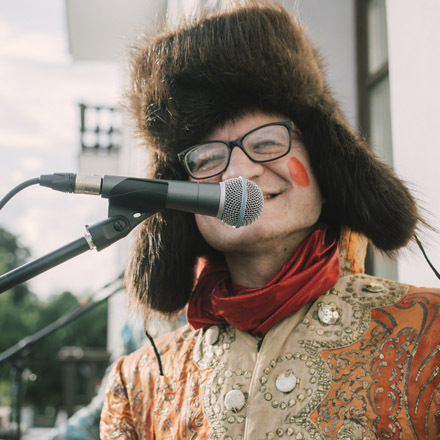 When: December 1, 7 p.m.
Anacondaz returns to Minsk: Astrakhan pauzern rappers drag into Minsk their sixth album, stuffed with juicy riffs and biting couplets. If you want to get really wet in a slam and pillage your favorite tracks – come and enjoy. When: December 1, 11 p.m. – 7 a.m.
A techno party project that relies mostly on local musicians is celebrating their 3rd birthday. During this period the project grew from a small chamber format party to a great rave with thousands of people. When: December 2, 7 p.m.
Headliners of the Belarusian ethno-electronic scene invite you to a concert dedicated to heartfelt affairs: together with Papa Bo Selektah, Rutvica and I/dex, Shuma will play a music session dedicated to love. Also, the duo will present a clip for the song “Khmarki”. Another awesome freak-show by Kassiopeia – what can be better to start your winter in the right way? If you still have not seen or heard of Kassiopeia, check this out to get ready. When: December 4, 11; 9 p.m.
We're watching The Postman Always Rings Twice on the 4th and They Live by Night on the 11th. All movies are in English. When: December 7, 7 p.m. The British group is returning to Belarus with their golden hits. With the years of experience, the authors of the immortal hits “Easy Livin '” and “July Morning”, the legendary Uriah Heep continue to delight their fans with incredible live performances and their favorite hits. The band will show itself in all its musical power and will play both its most famous hits and new songs. The Winter’s Tale is Shakespeare’s great play of the irrational and inexplicable. The play’s uncontrollable emotions – rage, love, grief and forgiveness – range across gender, country, class and age. Its universe is full of monsters, gods and natural disasters, and its colossal sweep takes us from stifling courts to unbuttoned festivals. Minsk residents and guests of the capital will be able to see not only the strongest documentaries on human rights, but also to talk with film directors and other guests of the festival, as well as make a comic rating of the most thoughtless decisions of officials over the past year. There are 15 films in the festival program, which will be shown in the Mir cinema and on the OK16 venues. GDG DevFest Belarus is a community conference dedicated to web & mobile trends, as well as some other IT technologies. The speakers are true professionals and the real leaders in the area (Google, Booking, EPAM etc). When: December 20, 7 p.m.
One of the brightest performers of the year, appeared out of nowhere and quickly gained popularity thanks to simple songs with a guitar and rethinking the hit from the nineties. Her hard guitar reef is accompanied by bass and drums. Her cover of the song “Love me love” got into the rotation of radio stations. When: December 28, 7 p.m.
For the first time, Algiers will come to Minsk. Is an American quartet, which charmed the intellectual listener with a marvelous cocktail of dark industrial, post-punk and gospel. According to music critic Artemy Troitsky, the most interesting thing in the history of Algiers is “the fact that this is the rarest case in modern music, when musicians came up with something really new.” And most importantly – this new could shoot into the heart. When: December 29, 7 p.m.
Lyapis-98 gives its fans a new opportunity to meet in the New Year's atmosphere. On the New Year’s eve, you can break into the concert of Siarhei Mikhalok and Co: space circus outsiders orchestra Lyapis-98 will play a ton of hits, vibes and nostalgia on the audience. There are only a few tickets left, so do not put off and grab yours.